Bishop Wachtstetter finished his book about Russia just a few days before he died in 2017. He had a great love for the lost people of Russia and while visiting a church in Russia he noticed the grapes growing over the pastors’ garage. He remembered that Noah was a tender of grapes. This got him thinking about Gods influence over that region and started doing research. Most of the Russian history regarding God in the region had been ignored over the years of the Soviet Empire. He wanted to write about the time from Noah until now. Noah landed in the Mountains of Ararat and began moving north with Japheth and his family. And his knowledge of God. 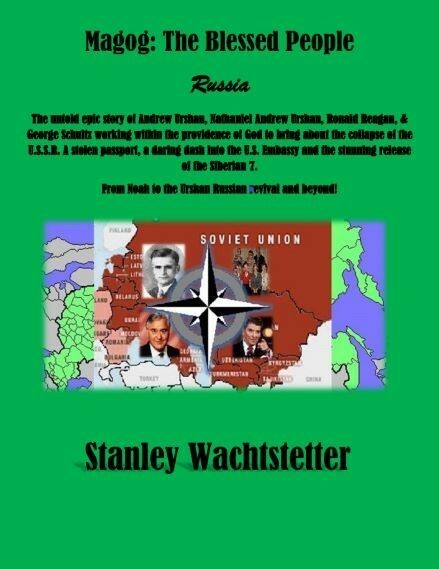 This book will explore Gods repeated attempts to influence the nations including Apostle Andrew and in modern times Andrew Urshan and his son Nathaniel Urshan as well as Stanley Wachtstetter and many others. Many of these miracles have not been told until now. Nathaniel Urshan passed away not realizing the importance of freeing the Siberian Seven to President Raegan’s push to end Communism in the Soviet Union.